Stephen King’s celebrated book series receives the big screen treatment in Nikolaj Arcel’s The Dark Tower. I’ll start off by saying that I know almost nothing about The Dark Tower in any form. I know it’s a series of books that a lot of people rave about but beyond that my knowledge of it is almost non existent. I’m not here to compare this to the books or judge its merits as an adaptation because I’m far from qualified to comment but the one thing I can do is comment on how successful it is as a film in its own right. The main problem with this film is that it fails to make any sort of impression one way or another. It isn’t visually interesting, the story fails to captivate in any way and the characters are woefully underdeveloped. The most that can be said about this film is that it doesn’t overstay its welcome thanks to a really short running time but even that couldn’t qualify as praise. 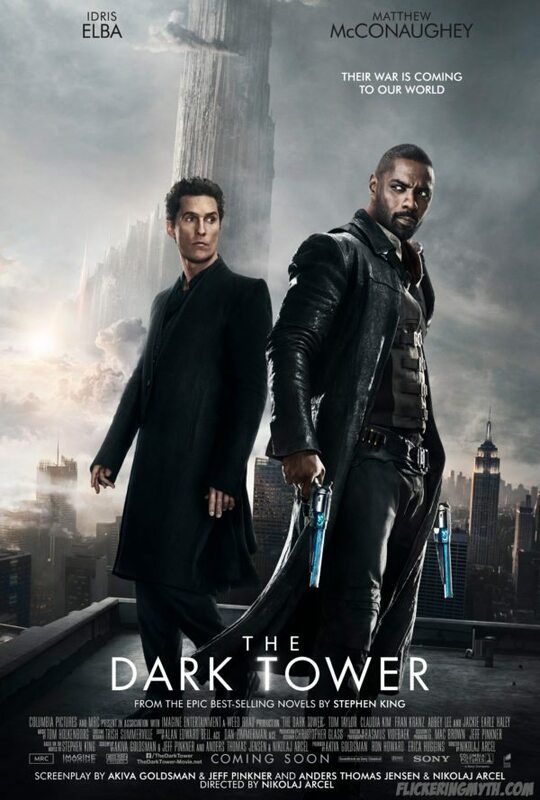 The story here is really simple; a young psychic kid named Jake (Tom Taylor) is wanted by a mysterious evil Sorcerer named Walter who is also referred to as the Man in Black (Matthew McConaughey) to use his vaguely defined powers to destroy the titular Dark Tower so that an army of Demons -I think- can be unleashed. Jake is protected by a Cowboyesque man named Roland aka the Gunslinger (Idris Elba) and the bulk of the narrative focuses on Walter’s attempts to capture Jake. Unfortunately that’s pretty much it and none of it is presented in a way that attempts to rise above the mediocrity. All of the characters are really thinly sketched and the story beats are entirely predictable. There’s no reason to care about anything that’s going on here or anyone it’s happening to which is a shame as there are hints of something much deeper beneath the surface. The idea of parallel worlds is always a fun thing to play with but this film does very little with the concept. We see two of them with one being an approximation of modern day New York and the other visualised as a post apocalyptic Western. The contrast is actually fairly well done with the hints of some kind of cataclysm on Roland’s world in the distant past. Hints of familiar things in our world are seen but they are covered in ash and faded with time. It’s the only visual flourish in the film that impressed me which wasn’t enough considering the overall blandness. In terms of acting the film is fine. Idris Elba does an effortless job as Roland which is remarkable considering how poorly defined the character is. He manages the silly dialogue believably and plays the character with more than a hint of sadness after a life filled with loss. Tom Taylor is fine in the role and manages to carry the film well suggesting that he may be a talent worth looking out for in the future. Matthew McConaughey plays a bland moustache twirling villain but his screen presence brings a lot to the table even though there’s almost nothing to work with. With a longer running time there could have been something interesting here. The implied history between Roland and Walter was there to be developed and some exploration of what drives Walter to bring down the Dark Tower would have been nice. As far as this film is concerned people simply do things because they are in the script with no reasonable on screen reason given for any of it. If the books have a rich mythology that is there to be mined then I wonder why those involved with this film didn’t use the opportunity to have some fun with it. Sadly the film doesn’t even work as an action movie. The action sequences are few and far between with very little to recommend about them. Some of the gun play is mildly impressive but the action climax feels really flat since there is no reason to invest in anything that’s going on. The film doesn’t really have an ending either as it pretty much just stops. This makes sense when you bear in mind that the purpose of this film is to begin a multi platform experience that continues in a TV series. Sadly it doesn’t really work as the pilot of a TV series either. An underwhelming and unremarkable action film that has the suggestion of potential beneath the surface but never bothers to explore it. The characters are bland despite the actors doing the best they can with what little they have, the action is far from memorable and the plot is forgettably bland while being hopelessly uninteresting. Nothing about this gives any reason to be invested in what is going on. The worst sin is that it fails to make any sort of impression one way or another and I suspect it fails as an adaptation of the source material.